I know the look. They all know me. I see the hesitation, suspicion, and blatant curiosity. It’s been there my whole career. The quick moment of worry whenever HR comes around. Rarely are people excited to see us because all to often 1 or more employees from HR heading your way means you are about to have a bad day. Is that the reaction I want? Definitely not. Do I try to go out of my way to be friendly, approachable, and competent? Absolutely. Does it make a difference in employees reactions? Not always. Is that reaction sometimes justified? Yes. And I bet you feel the same way. 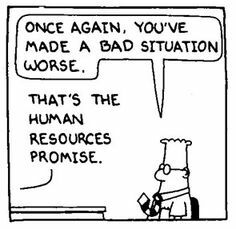 HR sees a lot of the good and the bad in an organization. It gives our profession a certain reputation that is hard to get around. But HR is capable of being more than what people fear we are. We can be partners and fighters. We can be supporters and strategic. We do not have to be defined solely by the tough conversations we have to conduct. And we can do it all while modeling respect and enabling our employees to succeed. The more I model the best aspects of my profession, even in the face of these negative perceptions, the fewer reactions I get. The more I share of myself and let my personality out, the more welcome I am when walking the halls. I think it’s the least I can do to make the biggest impression on employees. I may not succeed at it every day, but as far as professional goals go, I think it is very attainable for all of us.